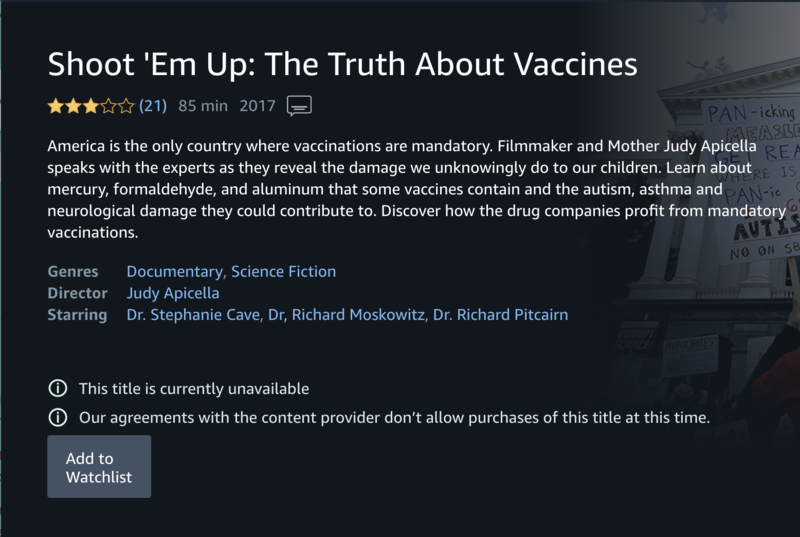 Amazon appears to have removed anti-vaccination documentaries from search results on Amazon Prime Video today, as well as from the catalog of videos included with its Prime service. On Friday morning, a search for “vaccines” on Amazon Prime Video returned top results for anti-vax documentaries, including Vaxxed and Shoot ‘Em Up: The Truth About Vaccines. But by Friday afternoon, those videos were no longer appearing in search results or available for streaming on the platform. “Vaxxed” no longer appears in search results. Around noon Eastern Time, California Rep. Adam Schiff published an open letter to Amazon CEO Jeff Bezos asking that Amazon reconsider allowing anti-vax content to appear on its website. “Amazon is surfacing and recommending products and content that discourage parents from vaccinating their children, a direct threat to public health, and reversing progress made in tackling vaccine-preventable diseases,” Schiff’s letter reads. Schiff had written similar letters to both Google, which owns YouTube, and Facebook, asking those platforms to address the anti-vax issue, in part because of the ongoing measles outbreak in Washington state. Following Schiff’s letter, YouTube banned advertising on some anti-vax videos and added additional information panels about vaccine hesitancy to anti-vax videos. Previously, the company announced via a blog post that it’s working to down-rank conspiracy theories in its “Up Next” recommendations. Facebook also says it’s “currently working on additional changes” to “reduce the distribution of health-related misinformation on Facebook,” and will announce “additional changes” soon. All three of these anti-vax titles, which were accessible on Amazon Prime Video on Friday morning, are no longer available for streaming. In his letter, Schiff explicitly asked Amazon: “Does content which provides medically inaccurate information about vaccines violate your terms of service?” According to Amazon’s content policy guidelines for Prime Video, it bans “content that promotes, endorses, or incites the viewer to engage in dangerous or harmful acts.” A spokesperson for Amazon did not immediately respond to questions about whether that policy is related to the changes regarding anti-vax videos. Although anti-vax films like Man Made Epidemic that were previously accessible on Amazon Prime Video are no longer available to Prime members for free streaming, DVDs of that film (along with Vaxxed and Shoot ‘Em Up) can still be purchased. Another documentary that was removed from the free Prime bundle, The Greater Good, remains on the platform now requires a third-party channel subscription. Ryan Broderick contributed reporting to this story.